One of the most common upgrades RV owners take on is replacing the galley faucet in their RV with a higher-end model, like one found in their home. The goal is not only to have something that is longer-lasting than the plastic one that comes standard in most RVs, but also to have a sprayer at the sink. But hang on, here’s the snarl: You’ll often find that household models have different connections than RVs and, while it can be done, you may waste considerable time if you don’t choose a model with connections that match your existing faucet. Look closely at the base of your RV faucet — you’ll often discover what you have is mounted in what’s called a two-hole sink, with spacing 8″ apart. The faucet itself has a 1/2″ plastic threaded male end which mates into a 1/2″ threaded female swivel on the water lines up to the sink. The red is hot, the blue is cold; and if the lines are not colored, simply mark them with a Magic Marker before disconnecting the faucet. It’s much simpler if, on your trip to Lowe’s or Home Depot, you choose a replacement faucet that is a two-hole model and has the same 1/2″ connectors as the one in your RV. If you do that, the swap is drop-in with no changes necessary. In order to have a sprayer, choose a faucet that has the sprayer in the end of the faucet rather than one that requires an additional hole at the top of sink. Sadly, many RVers choose a replacement that says it comes with “easy to attach water lines.” They are easier to install only in your home — but not in your RV. These faucets will take additional fittings and considerable thought in order to adapt the new to the old water lines, unless they duplicate what you already have, which you may find in high-end RVs with household fixtures. If you are not sure, turn off the water to your RV, pull the old faucet and take it with you when you go looking for a replacement. If you are not sure how to make what you want fit what your have, ask for help at the store where you buy it in order to save a multitude of trips back and forth. Planning before buying will be a time-saver for sure! 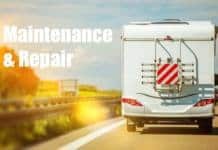 Why is there no pressure in RV fresh water plumbing system? Can we use bottled water for the RV toilet in winter? Our bathroom sink P-trap froze!